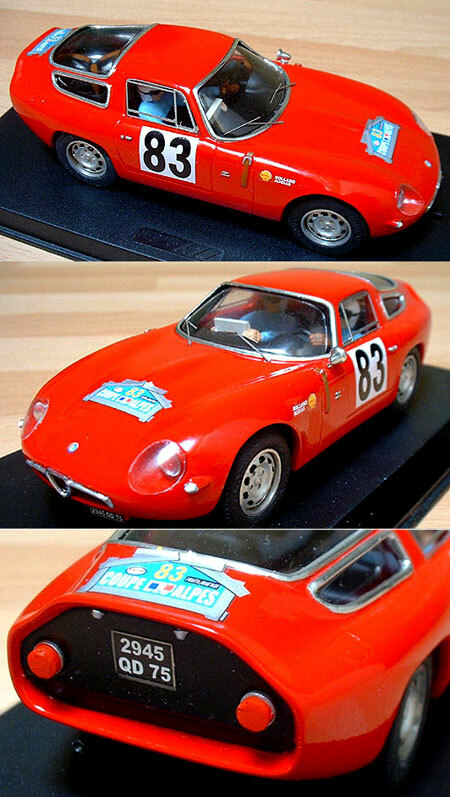 Proto Slot CB007P Alfa Romeo TZ1 BODY KIT, "Tubolare Zagato"
Painted body kit designed for the NINCO Ferrari 166MM chassis, this kit reproduces the famous tube-frame TZ which successfully ran in rallies as well as road racing, notably at Le Mans, establishing a solid reputation of performance and reliability. Also fits PCS32 chassis. Includes decals to finish body as shown in illustration. NOTE: The body in this kit is painted in the overall body color. Kit may require additional painting to complete as shown.Need a chassis for this body? See all the available universal chassis HERE. In that category you will find a variety of chassis manufactured for the purpose of building complete cars from body kits. We have tried to include in the product page for each chassis as much manufacturer's information as possible, but this is often somewhat scant. In general, your best option is to select a chassis with adjustable wheelbase so you can simply set the wheelbase to fit the body. Also, the narrower the chassis, the wider the wheels and tires you will be able to fit under any given body.